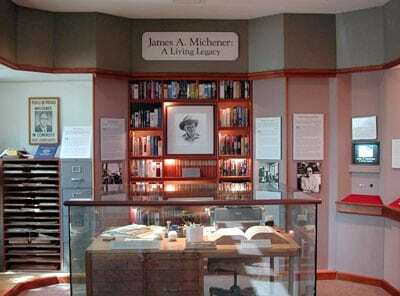 This intimate exhibition celebrates James A. Michener’s prolific career as a writer, public servant, art collector and philanthropist, as well as his life-long commitment to racial harmony. 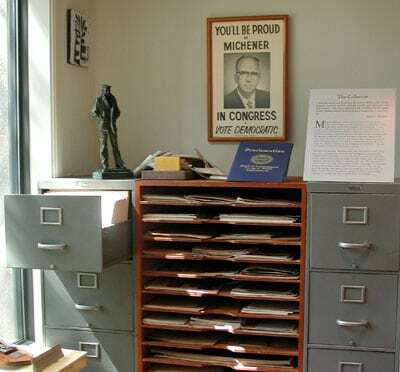 Michener’s Bucks County office is installed at the museum, and the exhibition includes a specially produced video, the Presidential Medal of Freedom and the original manuscript of The Novel. The museum was named in honor of the Pulitzer Prize-winning author and Doylestown native. This is a permanent exhibit on the author, which recreates his Bucks County office where he wrote Tales of the South Pacific. 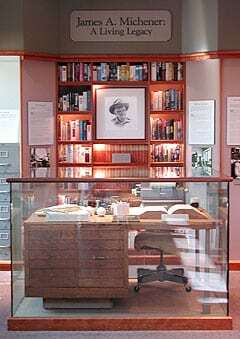 This room features the desk, chair, typewriter, dictionary and other objects from the office in James A. Michener’s Bucks County home where he lived and worked for more than 35 years. It was at this desk that he wrote some of his best-known fiction and non-fiction works, including Sayonara, The Floating World, Caravans, and Sports in America. Other objects on this desk include two autographed baseballs from the Baltimore Orioles, a dog license issued in 1965 for his 9-year-old terrier, his Gypsy Witch Fortune Telling Playing Cards, and his Doylestown High School T-Shirt. Select a link below to explore the exhibit! 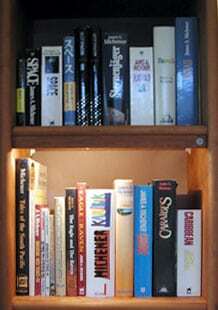 Michener had over 40 books published, translated into more than 50 languages, with world-wide sales in untold millions. Hawaii alone has sold well over 7 million copies and total sales in hardback surpassed 20 million in the early 1980’s. In this area of the Michener room, the rows of books to the right of the drawing of Michener are a set of first editions of Michener’s books, Michener’s biographies, and other Michener works. The rows of books underneath the drawing are books from Michener’s personal collection from his Bucks County home, including the complete works of Balzac given to him by his Aunt Laura when he was a boy. 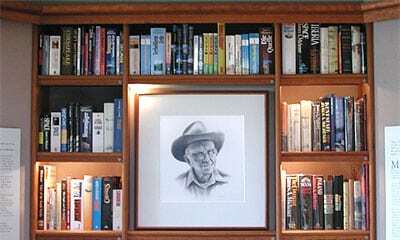 The shelves to the left of the drawing include a selection of Michener’s books and their translations in different languages such as Danish, Dutch, Finnish, French, German, Italian, Japanese, Portuguese, and Swedish. A typical writing project for Michener may have had a period of gestation and early research lasting as long as seven years, resulting in a basic story outline and a sketch of the characters and settings. This was followed by extensive personal research, using books, professional literature, interviews, libraries, etc. The research was almost always accompanied by lengthy travel and residence in the location of the book. When the research was complete, the writing began. There have been mistaken beliefs about Michener’s creative process. People assume that no single person could possibly accumulate and retain all the information in a given novel, so Michener must have had a staff of highly paid researchers. But the author was blessed with an extraordinary and near-photographic memory, and he had only occasionally used any research help. In fact, for the most part, he didn’t even need to take notes! This is a close up of Michener’s manual typewriter featured in the exhibit. Even with the invention of Dictaphones and computers, Michener continued to write words to paper the same way, hunched over an old manual typewriter, pecking with two index fingers. On a good day, he wrote 2,000 words, reaching 500,000 for a full-length novel. 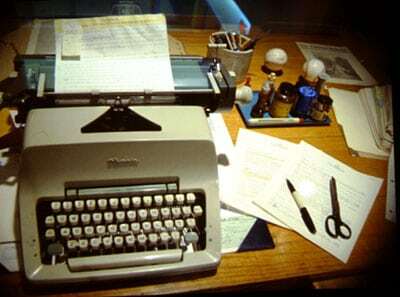 To the right of his typewriter you can find part of the original manuscript for The Novel. Once the completed manuscript was written, it was then re-written from beginning to end at least once, sometimes two or three times! As chapters were finished, they were sent to a secretary for transcribing and initial editing. Finally, the entire book was “worked over” completely by the editors at Random House, Michener’s principal publisher. So, a given page of the original manuscript may have been re-written as many as 3-5 times. After the work was complete, experts were then hired to confirm the accuracy of the basic facts and history. When you visit the museum, see what other items of Michener’s you can find on this desk. 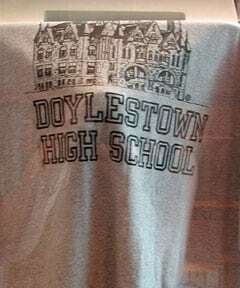 This is a closer look at Michener’s Doylestown High School T-shirt. He graduated from Doylestown High School, now Central Bucks West, in 1925. He was president of his class and valedictorian. The same year he received a scholarship to Swarthmore College. Do you have a collection? If so, what do you collect, and why? Beginning at the age of seven, James A. Michener began collecting reproductions of paintings, often cutting images from magazines and pasting them to a small piece of cardboard. In this area of the Michener Room, you can see some of the art reproductions that Michener acquired from museums around the world. His collection numbered in the thousands and represented examples from American and European painting. Later in his life, Michener and his wife, Mari, devoted much of their spare time to learning about and collecting both Japanese prints and 20th century American paintings. The Micheners donated 5,400 Japanese prints to the Honolulu Academy of Art, and more than 300 paintings to the University of Texas. Several Abstract Expressionist paintings in the University of Texas collection are on long-term loan to the Michener Art Museum. Also in this section of the Michener Room, you can find a poster of Michener, who ran for Congress in 1962. He lost by 17,000 votes. After losing the election he turned from politics, declining an offer to run for Congress again in 1964. 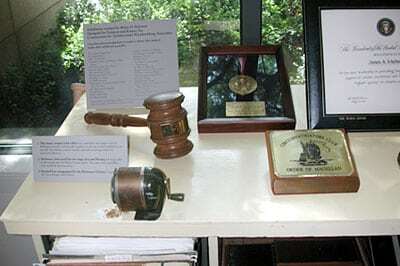 Other awards given to Michener found on this desk include: the Bucks County Commissioners Distinguished Service Award in 1985, and the Freedom Award – Outstanding Service for a Free Hungary, commemorating the Hungarian Revolution on October 23, 1956. This desk also includes a gavel that was presented to Michener on his address to the Texas House of Representatives on March 28, 1983. Here you can find the speakers that Michener built to accompany his music system that was in his office. These shelves also contain records and reel-to-reel tapes from Michener’s personal collection. Michener was an avid opera buff, and you can see many tapes that he collected. 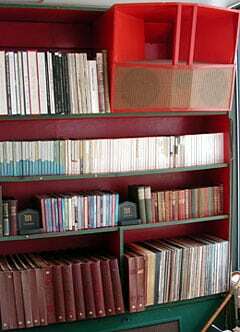 Displayed on these shelves, you can find many tapes on opera, a book on Don Quixote, tapes on Barbara Streisand, Tchaikovsky, Aaron Copland, and Bob Dylan. Also in this area of the exhibit, Michener’s cane and the leash for his dogs are displayed. Michener often took his dogs Java and Burma for long walks in the woods near his Bucks County home. Do you notice anything unique about the names of his two dogs? Java is an island in Indonesia, and Burma is a country which has India, China and Thailand as its borders. Michener wrote about both of these locations. 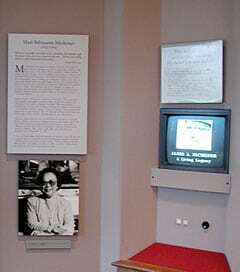 This area of the exhibit features information on Michener’s wife, Mari. Mari Michener was born in Las Animas, Colorado to a farmer who left Japan in search of a better life in America. After the bombing of Pearl Harbor in 1941, Mari Sabusawa and her family along with 100,000 other Japanese Americans were forced to live in internment camps. Mari Sabusawa Michener met Mr. Michener in December 1954 and they were married the following year. She became the author’s friend, confidant, and constant companion in his nonstop journeys around the world. She was an energetic partner in his activities as an art collector, taking an active role in collecting 20th century paintings. This area of the room also features a video with clips from the films and TV series that were made from Michener’s novels. The TV series’ include: Adventures in Paradise, Centennial, and Space. The films include: The Bridges at Toko-Ri, Caravans, Hawaii, The Hawaiians, James Michener’s Dynasty, Return to Paradise, Sayonara, South Pacific, and Until They Sail. 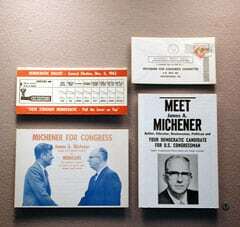 After losing his election for Congress, Michener remained very active in public affairs for over 25 years. Few people realize how truly serious Michener was about the run for Congress. He said afterwards that the defeat was the greatest disappointment of his life. If he had won the election, or if a challenging and appropriate ambassadorship or other political appointment had come his way, it’s possible that he would never have done any serious writing again. In this area of the exhibit, you can see various objects from Michener’s Congressional Campaign in 1962. One of the objects includes the democratic ballot. When you visit the Michener Room, see if you can you identify the former president who is shaking hands with Michener featured on one of the objects in the display. 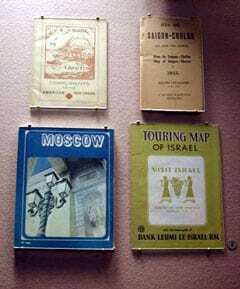 This room features a collection of Michener’s personal road maps from around the world, including maps of Tahiti, Saigon, Moscow, and Israel. Can you find these locations on a map? Michener was a traveling man. He started to hitchhike at the age of 12. By college, his hitchhiking took him to 45 states. During World War II, he visited 49 islands and logged 150,000 miles throughout the South Pacific as a historian and an investigator for the U.S. Navy. In 1931, he traveled to Europe under a fellowship from Swarthmore College. When Michener’s writing career took off in the late 1940s, Michener began to travel again. For the next 40 years, he traveled to an often lived in the locations of all his major works of fiction and non-fiction. A massive heart attack in 1965 did not slow him down. He learned many lessons while on the road. 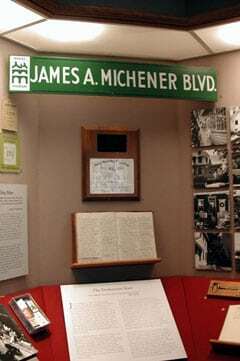 This Boulevard Sign was presented Michener on James A. Michener Tribute Day in Doylestown, on May 8, 1985. Main Street was changed to Michener Boulevard for that day. Under the James Michener Boulevard sign, you can find a commemorative plaque from Central Bucks West High School that was presented to James Michener on the occasion of his 60th anniversary of his graduation from Doylestown High School. Under the commemorative plaque, you can find the registration book of the Melinda Cox Library, where Michener received his first library card, (number #797) in August 1917. If you look at the registration book, you can find Michener’s signature at #97 on the list. At the time, he was living at 304 North Main Street, Doylestown. 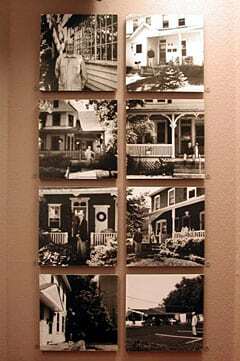 Michener lived in eight different homes in Doylestown, Pennsylvania, as a boy. Although Michener’s origins are a bit unclear, it is known that James was born in early February 1907, and was under the care of Mabel Michener in Doylestown. Michener had a difficult life as a child—amenities and food were always in short supply. The family moved constantly because Mrs. Michener could not keep up her rent payments. Mrs. Michener was strong willed and a generous person. It was in Doylestown where James Michener’s love of the arts began, fostered by his mother and the atmosphere created in the home. Mrs. Michener read stories by Dickens, Homer and Mark Twain to James and his siblings on cold winter evenings. In Doylestown, James Michener came in contact with teachers, coaches, and other community leaders who taught him that he could escape the poverty of his childhood through cultivation of his natural abilities. 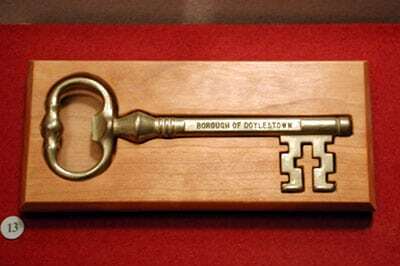 Exhibited underneath the images of Michener’s Doylestown homes, you can also find the Key to the City of Doylestown that was presented to Michener on James A. Michener Tribute Day, May 9, 1985. Michener was a very generous man. He used the income from his writing to fund projects and programs that related directly to the ways his money was made. Strongly influenced by both his Quaker heritage and his impoverished youth, Michener had a deeply felt moral conviction that he should not profit tremendously from the countries and subjects he wrote about, and that whenever possible, he should use the money to further the arts, especially writing. Each novel and nonfiction project was accompanied by a substantial donation, generally to support a university writing program in the location of the book. Michener gave a one million endowment gift to the Michener Art Museum in 1988, followed by the establishment of the Michener Art Endowment Challenge in 1992 (a program that tied endowment gifts to the donation of major paintings to the collection). When you visit this exhibit, you will see what a generous and devoted man Michener was in his writing, collecting, philanthropy, traveling, and his belief of the common good of every person.